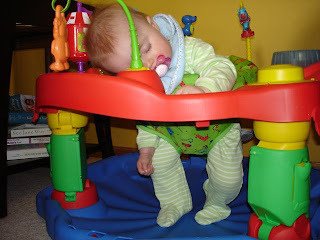 You know life is sweet when you fall asleep while playing and having fun and experiencing pure delight. Oh, how it broke my heart to have to wake the lil' dude up this morning, from her Exersaucer. When I did, she barely opened an eyelid as her little arm slid around the back of my neck and she nestled her fuzzy melon into the crook of my neck. So yeah, this morning, going to work? Was the hardest. Thing. Ever.